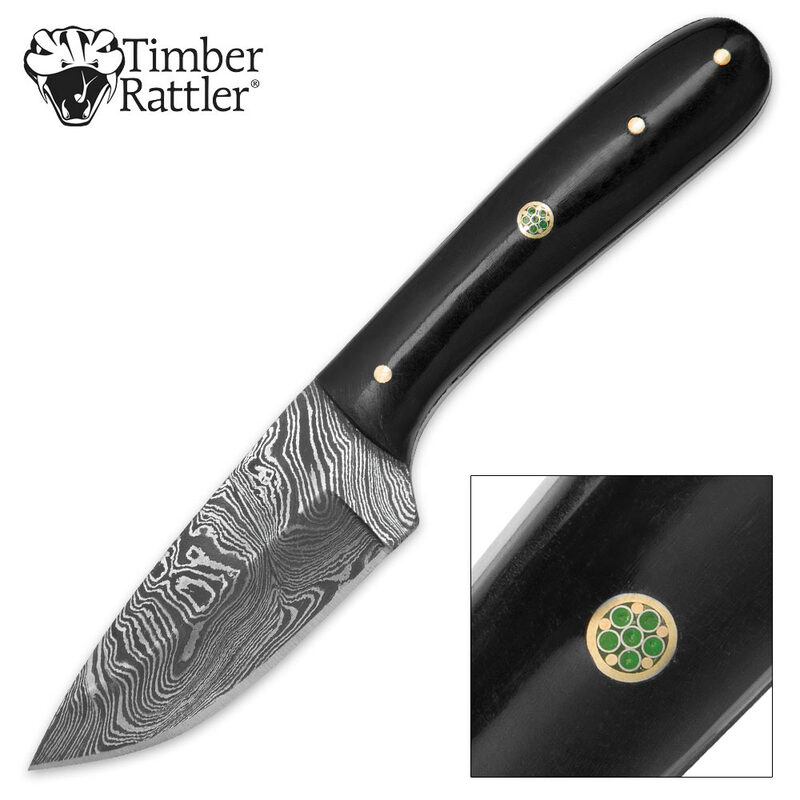 Timber Rattler Terra Preta Damascus Fixed Blade Knife with Leather Sheath | BUDK.com - Knives & Swords At The Lowest Prices! Timber Rattler’s Terra Preta Fixed Blade Knife boasts few frills, opting for raw cutting power, exceptional hand feel and quiet beauty. Its 3” 1095 Damascus steel blade is a whirlwind of inky lines - the result of an ancient metalworking technique that involves hammering red hot, fire forged steel into hundreds, even thousands of folds before a final acid etching. Such intricate details can only be achieved by the skilled hands of a master metalsmith - not automated punches or presses. Carefully honed to a razor sharp edge, the drop point blade is perfect for skinning, carving and other delicate tasks. That’s not to say it can’t slice and cleave its way through more demanding cutting jobs; if the “Terra Preta” is anything, it’s versatile. 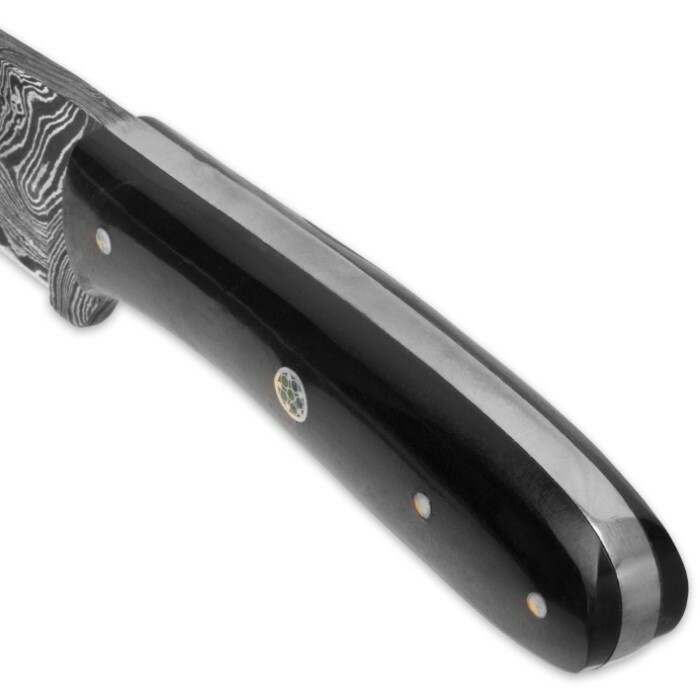 The deep onyx black buffalo horn handle beautifully complements the rippling dark likes on the Damascus blade. It’s gently contoured, which - along with the Terra Preta’s impeccable balance and weight distribution - affords superb handling. At 7” long overall, the Terra Preta is great for outdoor adventures. It doesn’t consume much precious limited space or add excessive weight to your gear, but it’s amply sized to tackle a host of wilderness cutting tasks. Properly cared for and housed in the included genuine leather sheath, Timber Rattler’s Terra Preta Fixed Blade Knife will last a lifetime and beyond, making it a distinguished family heirloom you’ll be proud to pass down for generations. Use it or display it; it’s ideal for both! The Terra Preta also makes a wonderful, memorable gift for a knife collector, outdoorsman or anyone who appreciates fine craftsmanship and attention to detail. After getting the small chips off the blade this has proven to be a handy little knife. It has a nice weight in hand and is sturdy. It came well oiled and sharp. Had it been perfect out of the box I would buy this again perhaps as a gift. I am however disappointed with the sheath and the handle. The one scale was severely cracked and mended with apoxy. Also with this particular knife the scales we're not flush with the Tang leaving a spot that may bother my palm with extended use. Overall a good knife. Well made little Damascus knife, Blade sharp out of the box, although with a small patch of rust, good quality sheath. Knife is a bit small and if you have big hands, this knife handle may be too small. I have small hands, and the handle just barely fits in my hand. Other than that, this is a keeper. Tom from Hawaii.